The recently renovated family hotel LOGAN ‘S BEACH HOTEL is located in Perigiali Lefkada, built on a green area and onto the beach (Pasa Beach) which is 1 km from Nidri and 15km from Lefkas. 8 double rooms with air – condition , TV , refrigerator , music and automatic telephone. 6 studios with air – condition , TV, kitchenette, music and automatic telephone. 2 triple rooms with air – condition , TV , kitchenette , music and automatic telephone. 1 two-room studio with a double room and a living room with air – condition in all rooms , TV , kitchenette , music and automatic telephone. 1 suite with a double room and a living room with air-condition in all rooms, TV, kitchenette and automatic telephone. The hotel is beachfront with panoramic view of the majestic PRIGIPONISIA: SCORPIOS (ONASI) , MADOURI (VALAORITI) , ROCK OF NYMPHS , MONUMENT DORPFELD . 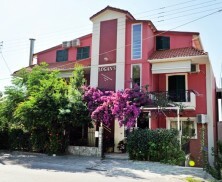 It offers wireless internet , big lift for luggage , restaurant – bar beside the sea and organized beach in front of the hotel .The directorate of LOGAN ‘S , (Logothetis family) welcomes you and promises dreamy and memorable holiday.